I tried to post this from my Blackberry last night, but for some reason Typepad's mobile function ain't working for me right now. Anyway, I took this picture at Wal Mart on Hanes Mall Blvd last night. Those who know me well know that I rarely shop and I only go to Wal Mart under extreme duress, so let's just say that I had to do a little searching to find what I needed: table leg levelers and table cloths for work. 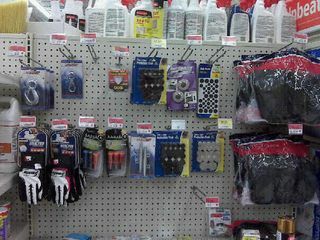 While searching for the levelers I found myself in the hardware aisle and stumbled on the display in the picture. Only in Wal Mart would you find a jockstrap, golf tees, golf head covers and batting gloves displayed next to the furniture gliders and other various and sundry hardware items. And yes, they were supposed to be there according to the price labels on the hangers. BTW, did you know it's damn near impossible to find a plain white table cloth? I tried, desperately, to find them at any place but Wal Mart last night and I struck out. Damn you, Target. I did find two ivory table cloths at Wal Mart fresh off the boat from China, but unfortunately when I unpacked them this morning they were stained. As in big, gigantic coffee looking stains. Had to happen at the manufacturer because the plastic containers they came in were sealed (not opened and returned). On a positive note the lady at the check out aisle was very nice to me. She was ready to close down but saw me in the next line with my two items and said she'd take care of me before she closed down. Always lookin' for that glimmer of positive, I am. This entry was posted in Winston-Salem on August 19, 2009 by Jon Lowder. I am with you on the Wal-mart thing. Not my place to be for everyday shopping. Target is more my speed. Wife swears by it but frankly the crowds, lack of sales flyers, that stupid checker on your exit out of the store do really make it a pleasurable experience for me. I’ve noticed at Wal Mart that if you want water filters, you have to walk all the way to the part of the store where they keep light bulbs and air filters. If you want toothpaste or shaving cream, it’s in another part of the store. However, the groceries are grouped together.